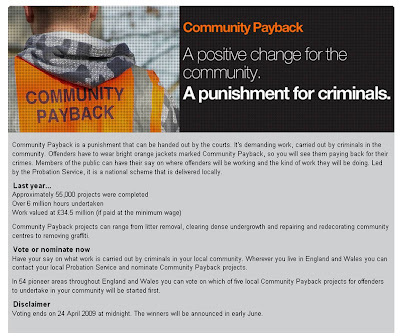 Under the slogan 'Justice Seen, Justice Done' the UK government is now giving the public the chance to vote on what 'Community Payback' / punishments should be handed out to the 55,000 recipients of community order sentences in England and Wales each year. Through the website at direct.gov.uk/communitypayback internet users can vote on which local community projects (from a choice of 5) they want offenders to pursue. Voting runs until midnight on 24th April and the 'winners' will be announced shortly afterwards. This is a great example of how 'social thinking' can be added to anything - though I'm yet to be convinced that the criminal justice system should be turned into some sort of X-Factor / Idol variant?